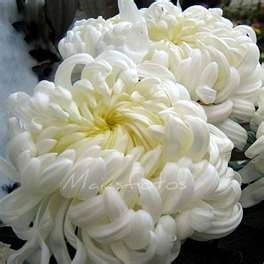 Chrysanthemums were cultivated as an herb as early as 1500 BC in China, and were brought to Japan in the 8th century AD where the bloom was adopted as the official crest of the Japanese emperor. 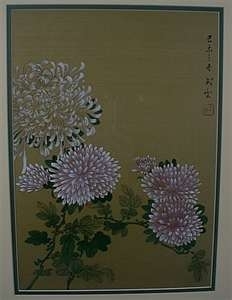 The chrysanthemum is widely seen in Chinese, Korean and Japanese paintings, textiles, metalwork and lacquer, and is very important in garden and floral design. The plant was introduced to Europe in the 17th century and given the name chyrsanthemum from the Greek words chrysous (“golden”) and anthemom(“flower”). As a hardy garden perennial it was quickly adopted by European gardeners, and the white variety was given the meaning of “Truth” in the Victorian language of flowers. 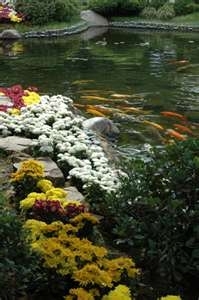 Florists use mums that are grown year-round in hothouses, but they are especially appropriate when used in the fall, when they are naturally blooming. The wonderful tones of rust, orange, gold and yellow harmonize with fall leaves and berries and create a true autumn look. There is even a variety known to florists as the “football mum”, due to its popularity in the 20th century as a corsage worn to autumn football games. This natural flower has evolved into a football “team spirit” tradition in Texas, where they are made from artificial flowers and elaborate ribbons, streamers and team logos. In addition to its decorative uses, chrysanthemum is dried and used as a medicinal tea, and is added to flavor a type of Korean rice wine.